When I left click, the 3D cursor no longer moves anywhere; it instead stays stuck wherever it is in the scene. 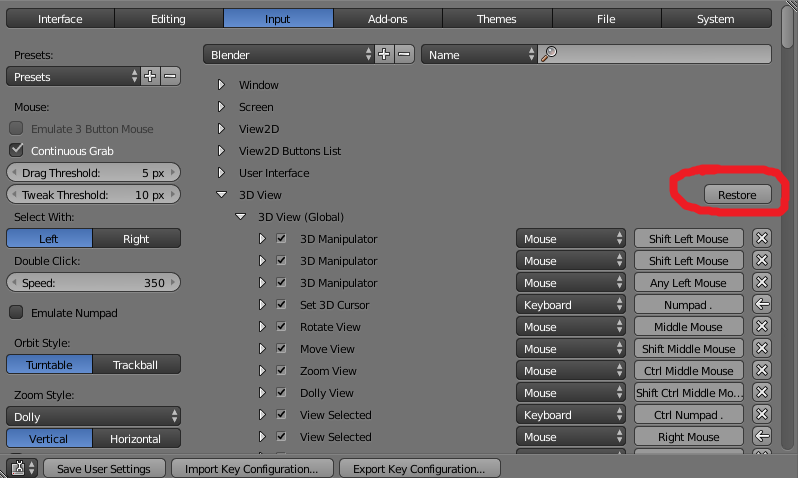 When I right click on anything, Blender zooms into whatever object is currently selected. I'm unable to select anything with the mouse; I can only select objects with keyboard shortcuts like 'A'. This happens with all new projects as well. I've tried exiting / reopening blender. Is there some setting that would cause this? How do I undo this? Whilst in the settings menu, Blender froze. After unsuccessfully trying to click on on some stuff, the preferences window disappeared. It turns out this somehow changed some input preferences. Restore any unwanted mouse configs, and you're done. If the mouse settings are wrong for new projects as well, click on 'Save User Settings' after restoring.